This pattern uses red, white, black and orange 8 ply wool and a 4 mm hook. It is written in American crochet notation. 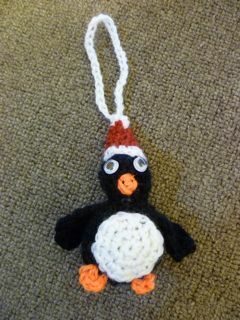 The finished festive penguin is 10 cm tall. 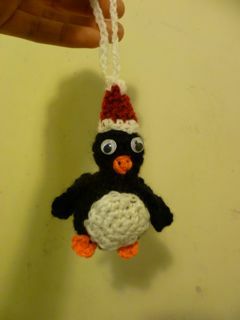 For the white bobble at the top, attach white wool to the top of the hat and sc 5. Sew the wings and tummy patch to the body. Sew on googly eyes and embroider the beak. Sew on the hat.